View the full 2018 Go 50 results below. 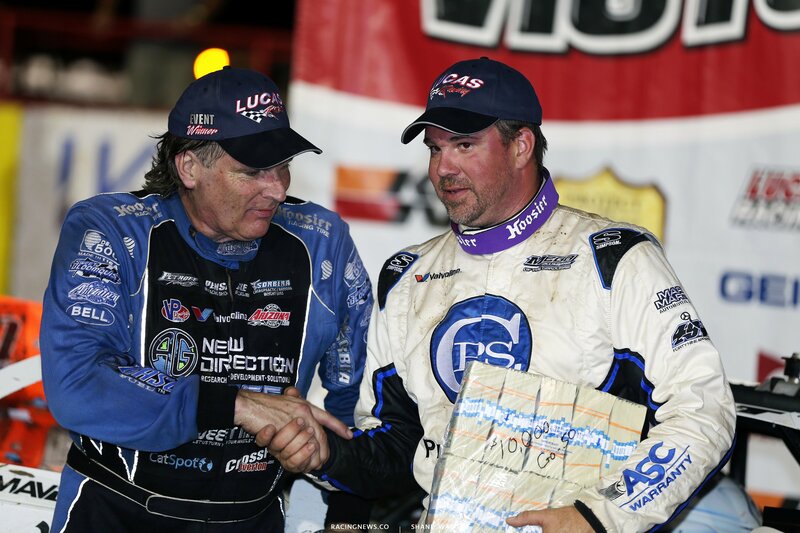 Scott Bloomquist was quickest overall in qualifying. He circled the 4/10 mile at 17.402 seconds. Josh Richards was quickest in Group B with a 17.433. 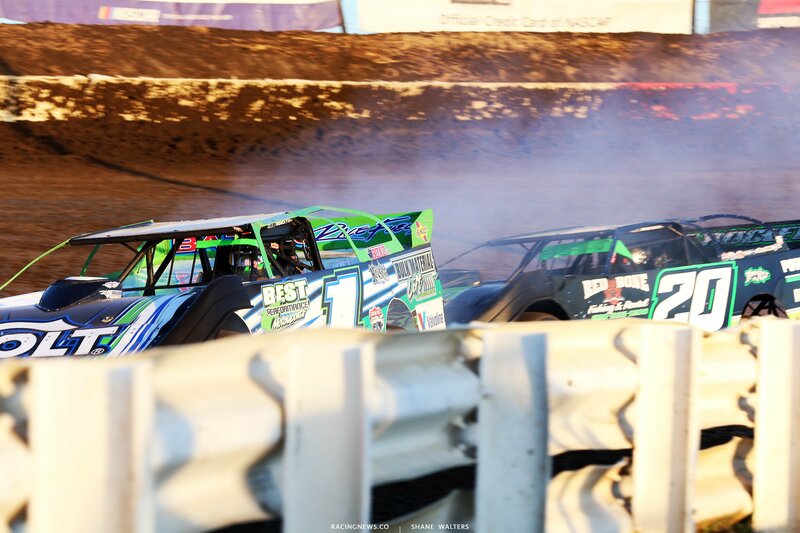 Scott Bloomquist and Chase Junghans set the front row for heat race number one. Green, Bloomquist leads into turn 1. Sheppard takes 2nd in turn 1. He’s looking for the lead in turn 3. Sheppard to the lead. 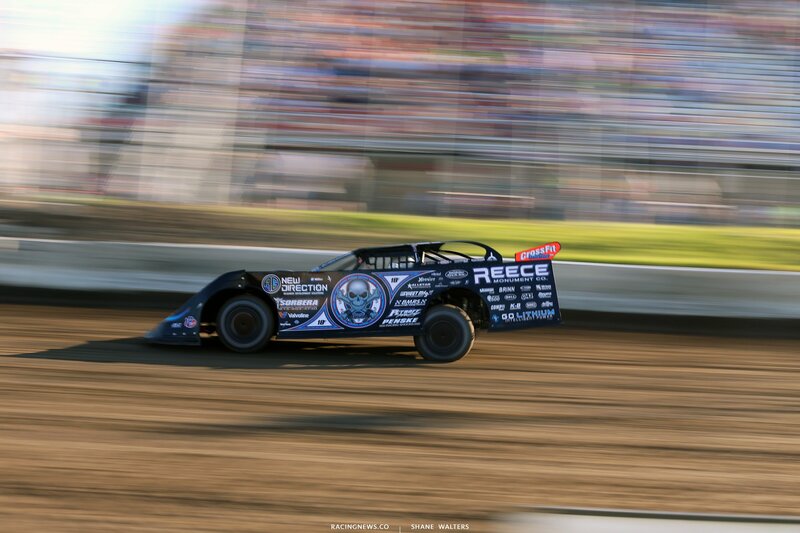 Bloomquist slides him back in turn 1. Sheppard crosses him. 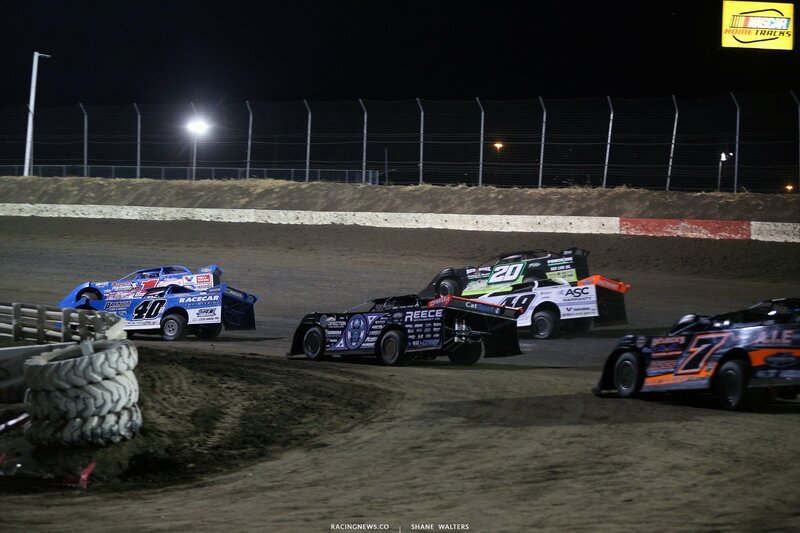 Sheppard opens up several car lengths on Bloomquist. The #0 erases the gap. Bloomquist is looking fr the lead on the bottom. He’s there but he can’t outrun the high side momentum off the corner. Brandon Sheppard wins heat race number one! Ricky Weiss and Kyle Bronson will lead them to the green in heat race number two. Green, Kyle Bronson wins the race into turn 1 on the top. They run 3 wide behind him. Weiss is closing on him. Weiss changes his line and cuts to he bottom in turn 1. Bronson opens up several car lengths. Kyle Bronson drives away to win heat race number two! Dennis Erb Jr drove from 9th to 3rd. Josh Richards and Jimmy Owens trail the pace truck ahead of heat race number three. Green, Richards leads into turn 1. Owens trails by 4 car lengths. Caution. Green, Richards leads. Owens is under pressure from Pierce. Just a few laps remain, Richards is up in smoke in turn 1. Owens nearly runs right into the back of him. No caution. Jimmy Owens drives away to win heat race number three! Jonathan Davenport and Hudson O’Neal set the lineup in the final heat race of the night. Green, Hudson O’Neal leads on the high side into turn 1. Davenport is coming in a hurry on the bottom. He makes up several car lengths on the exit and pulls even with O’Neal off turn 2. They run even into turn 3 and fight for space. The nearly make contact as they fight for space again on the bottom in turn 2. Hudson O’Neal lifts, Davenport takes the lead. Lap 7, Davenport enters high in turn 1 and cuts to the bottom off turn 2, late apex. Hudson O’Neal drives it way harder into the corner and drifts up the hill on exit. It’s completely opposite lines but near identical lap times. Davenport holds him off to win the final heat race of the night at I-80 Speedway! Earl Pearson Jr and Don O’Neal line up on the front row for the first B main of the night. Green, Pearson gets the jump. Don O’Neal makes it all back into turn 1. McCreadie and Satterlee run 4 wide off turn 2. The left side door is bent up on the #39 but they all continue. Lap 7, Don O’Neal leads, Moyer runs 2nd and Gregg Satterlee just moved by Pearson on the outside of turn 2 to take the final transfer spot. Satterlee runs down Moyer, he gets him on the final corner. Don O’Neal drove to the win. 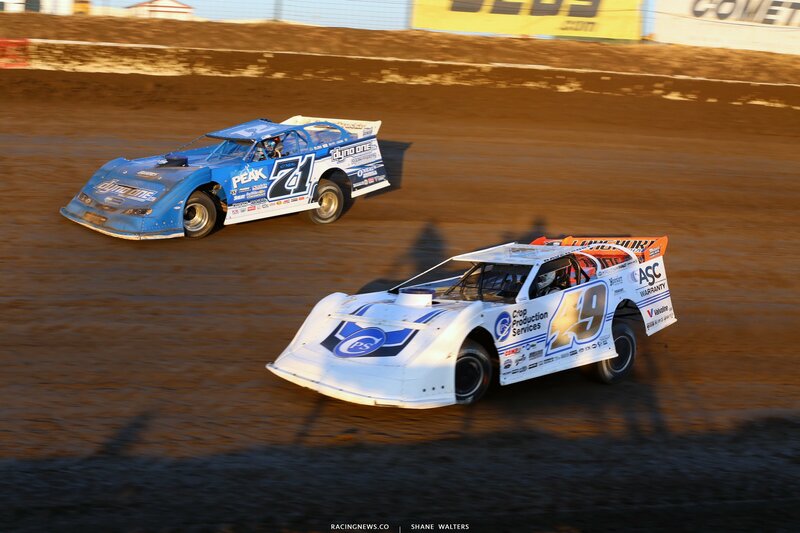 Satterlee and Moyer are the other transfer cars. Allen Hopp and Shannon Babb will lead them to the start in B main number two. Green, Hopp gets crosses up in turn 1, he loses 6 positions. Shannon Babb to the lead. Caution. Spin on the track. Green, Richards to 2nd. He begins chasing down Babb. He’s there. Richards looks low but he can’t get the power down off the corner. Caution. Green, Richards slides Babb for the lead. Hopp is in the wall off turn 2. The caution is back out. Green, Pospisil made a hard left off turn 2 to swing under Babb and try to take 2nd. He lost all his momentum as well as the final transfer spot. Josh Richards drives to the win. Babb runs 2nd and Landers 3rd. 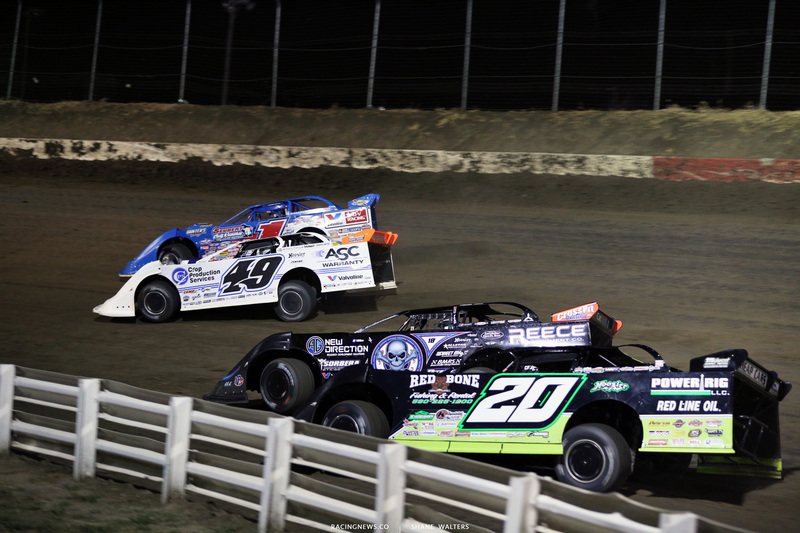 Brandon Sheppard and Jimmy Owens will lead the field to the start. 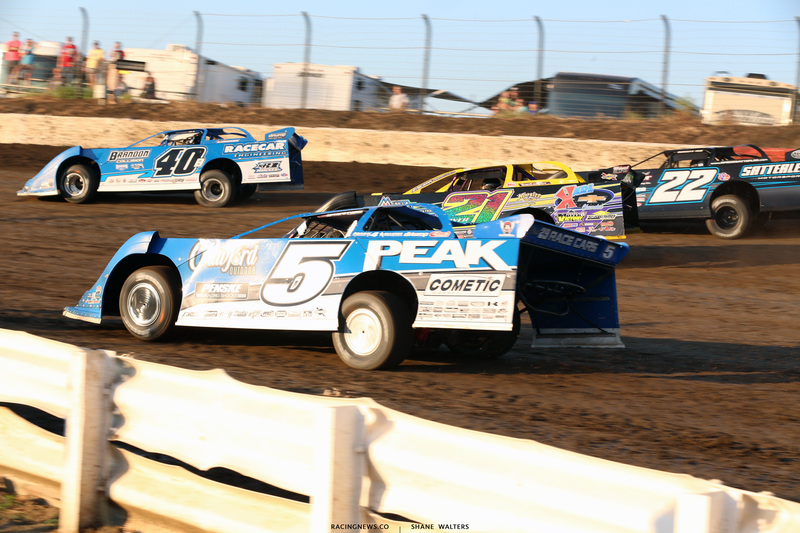 Earl Pearson Jr, Tim McCreadie and Darrell Lanigan take provisional starting spots in the main event. It’s a 50 lap main event in Greenwood, Nebraska. 4 wide salute for the crowd at I-80 Speedway and we’re off! Green flag, Sheppard leads into turn 1. Owens and Davenport look to the outside of Bronson. Bloomquist is around Owens. Lap 4, the caution is out. Zeigler has smoke coming from under the hood. Green, Sheppard leads. Davenport, Owens and Clanton run 3 wide for 3rd. Davenport wins that battle on the top. Lap 6, the caution is back out. Landers has a flat. Green, Davenport to 2nd in turn 1. Bloomquist to 3rd. Ricky Weiss and Hudson O’Neal fight for space. Weiss scraps the inside wall. Lap 12, Bloomquist to 2nd. Sheppard leads by 5. Lap 16, Bloomquist is there. He dives to the inside in turn 1. He completes the pass into turn 3. Bloomquist leads. Lap 25, Weiss hits the pits. Lap 31, Moyer hits the pits. All this is under green. Lap 33, McCreadie to the pits. The caution is out. Pearson to the pits. 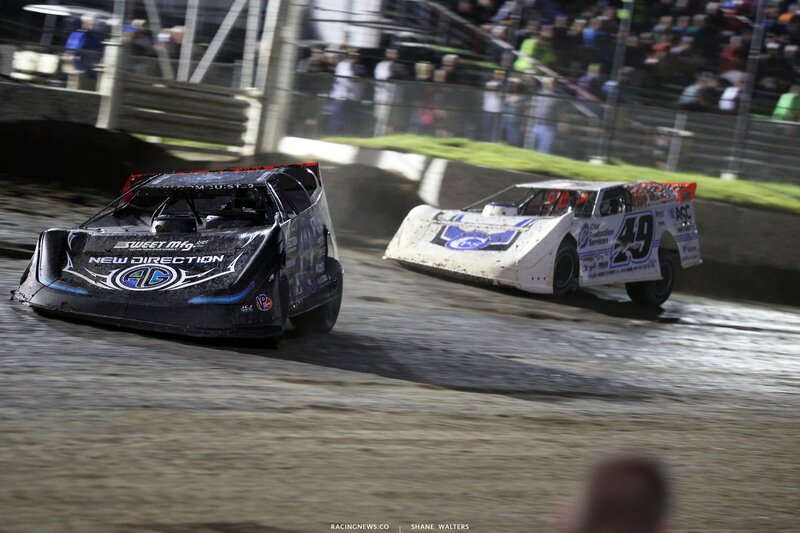 Green, Bloomquist leads Davenport into turn 1. Davenport has a run off turn 2. He looks high in turn 3. He’s there. They run even into turn 1. Davenport takes the lead. 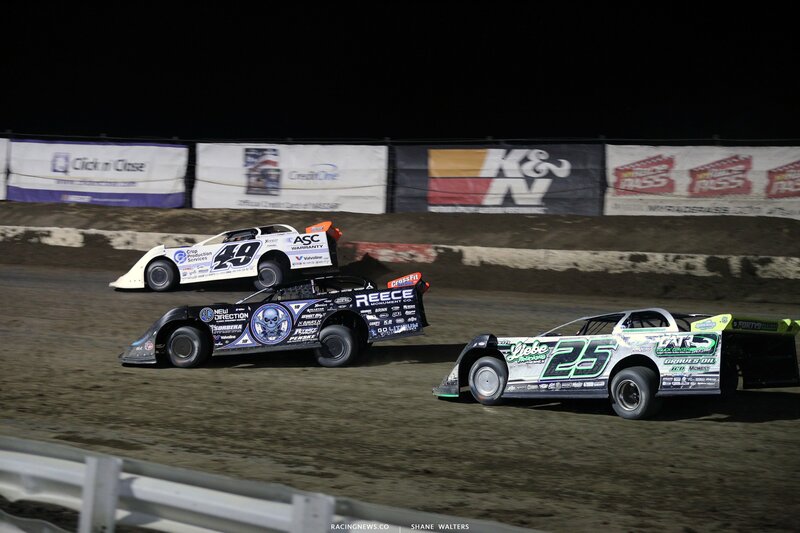 10 to go, Bloomquist is still fighting back on the bottom. He can pull to his door on entry but can’t get him on exit. 5 to go, Davenport pulls away. He leads by 4 car lengths. 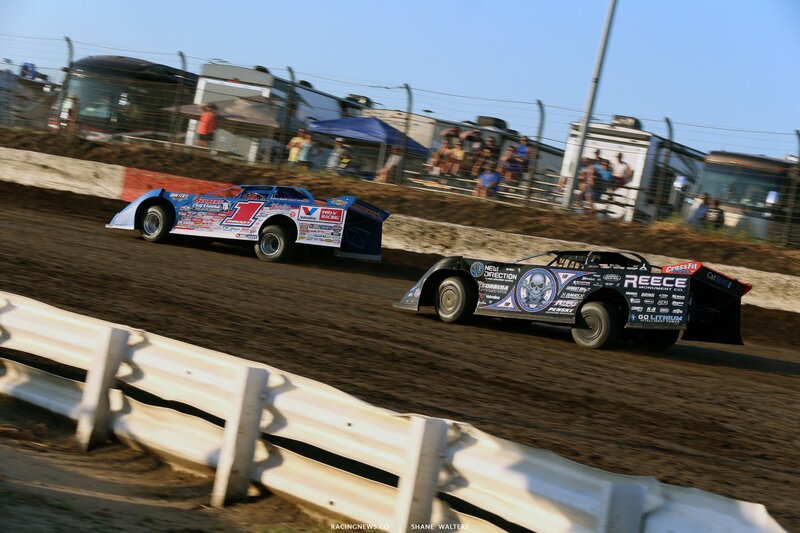 2 to go, Davenport works lap traffic and Bloomquist closes in a hurry. 1 to go, he’s there! They race 3 wide around the lap car of Chad Simpson. They run side by side off turn 4. Davenport beats him to the line. Jonathan Davenport wins the Go 50 at I-80 Speedway! Tomorrow night, the tour returns to the same track for an entirely separate two-day show. 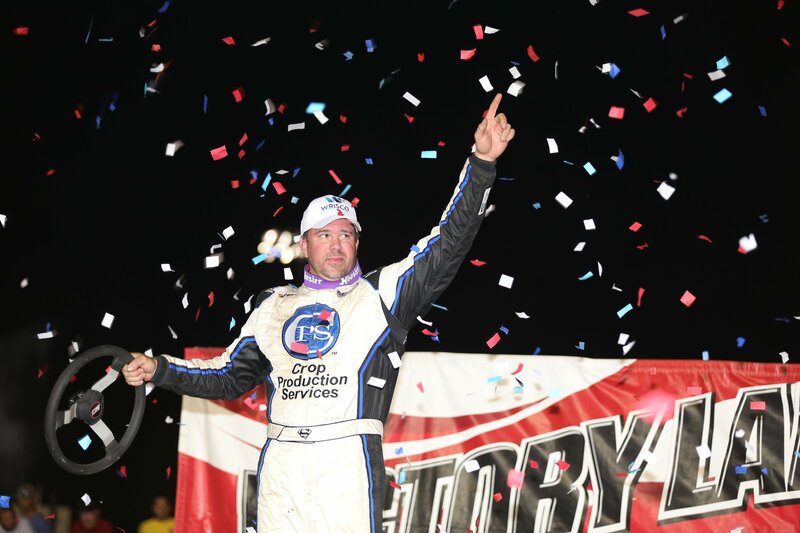 The Silver Dollar Nationals will pay $53,000 to the race winner.